Translation and research by Yea Eun Park. Did you know Korea has four seasons? First off is winter, marked by Jeju’s fierce winds, followed by the caprices of spring, which flirt — with heavy gusts. While these winds are largely absent for the summer months, the oppressive heat, coupled with the odd typhoon, make embarking outside no less of an ordeal. This leaves the glories of autumn — and the leaves are its glory. There can be no serious complaint about this season, with even the return of the not-long-departed blustery weather being reason for celebration after three months of high temperatures and extreme humidity. The season is embraced fully, and I find joy in bathing in the squelching scent of decaying leaves underfoot. It might be the English in me (we have four seasons too), but I find myself drawn to damp woodlands and only regard the trips as a success if the soles of my shoes are caked thick with mud. The sensuousness of the season embarrasses that other Jeju favorite, spring. Although sweeter in its redolence, the season of new life lacks the homeliness of autumn. Spring merely teases, never embraces, while autumnal early evening dusks promise warm and hearty stews for supper. Autumn’s comeliness is also apparent in its vistas which transform the landscape. 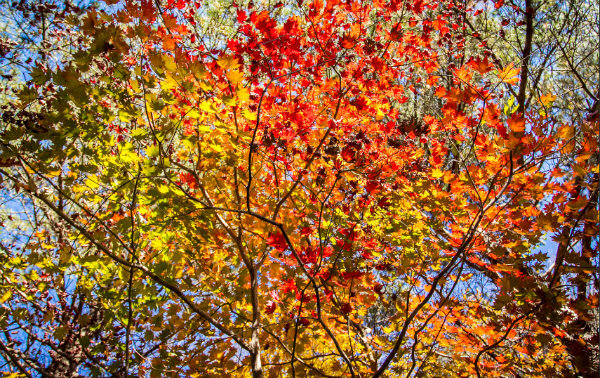 As the days shorten and the temperatures fall, trees go into a form of hibernation as less light means lower production of starches and sugars. Cork-like cell growths begin to seal off the leaves from their stems, and less of the green pigment, chlorophyll, is produced. This allows other pigments to shine through, such as carotene and xanthophyll, and for some trees, anthocyanins. As the greens fade, deciduous tree leaves glow with yellows, oranges and reds; the leaves are eventually severed, and woodland floors sparkle with their sacrifice. Anthocyanins are thought to be responsible for the brilliant reds, and they help trees recover nutrients from leaves, also protecting them from excess sunlight. Thus, after sunny and dry weather, as trees frantically hoard energy for the short nights ahead, more is produced. Early chills can even promote pigment production, although anything below freezing has the opposite effect. Koreans have long appreciated nature’s extravaganza, as evident in the popular pastime of “danpungnori,” or leaf viewing. Like most things here it has a long pedigree, with records as far back as the Goryeo era (918-1392) attesting that “Junggujeol,” the ninth day of the ninth lunar month (this year Oct. 2, 2014, in the Gregorian calendar) was marked by lavish celebrations. These continued into the Joseon era (1392-1910) when the day was made a national holiday and literati would ascend to mountainsides to imbibe chrysanthemum liquor, gorge chrysanthemum pancakes and wax lyrical about the autumnal views. “Foliage picnics” were also enjoyed throughout the Japanese occupation (1910-145). While the spring colors such as the cherry blossoms famously bloom first down on Jeju, the roles are reversed for fall, as Korea’s warmest and southernmost province waits patiently. Mountainous Gangwondo welcomes them first in early October, with pigments being produced when temperatures dip to 8 degrees Celsius. The colors thus migrate southward and seaward from the inland mountains. The more vibrant colors are seen on such mountains, especially if there has been little rain and plenty of sun. Deciduous broadleaf trees are located at higher altitudes on Jeju than on the mainland, typically at 900 to 1,400 meters, where you can see species such as Sargent’s cherry, Japanese Rowan, snowbell, and Korean and Japanese maple. This does mean that accessing the best areas for “danpungnori” requires a little extra exertion, but we think it is well worth it. All locations have free entry although some charge for parking. Yeongsil is the shortest trekking course to the top of Mt. Hallasan and Witse Oreum, giving magnificent views of the 500 Generals rock formation. 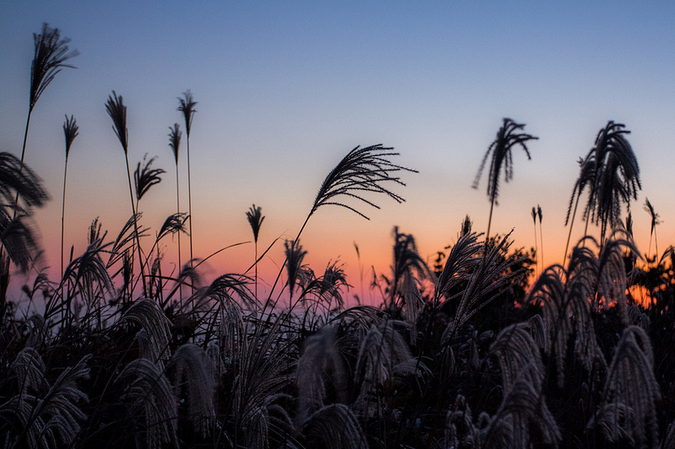 It is also one of the best places to get an eyeful of Jeju’s autumnal wonders; just ask a local! The course to the top affords the most beautiful “danpungnori,” where you can enjoy glorious reds, oranges and yellows. Away from the crowds in this tranquil corner, visitors can feel the fresh autumn breeze descend from Mt. Hallasan. The mountain’s famed deer might wander past to add to the woodland scenes. Initially this is just a deep forest walk, like the other courses, but as soon as you reach Samgakbong Peak the glories of Sobaengnokdam crater, Baengnokdam crater and Yongjingak Valley come into view. Otherworldly rock formations poke through the autumnal canopy of the surrounding woodlands, making this a view hard to beat, despite being a tough trek. At an altitude of over 900 meters, Handae Oreum is dominated by deciduous broadleaf trees and would be more frequented by locals if it weren’t so daunting. Compared to most Hallasan courses, the trails are somewhat hidden by thick undergrowth making them hard to follow. If you wait until November, this area is also good for Eulalia grass viewing. Korea’s harvest season holds another surprise, this time at ground level. While many of the secondary volcanic cones, or oreum, are forested, particularly in the upland areas, the grass-topped ones are transformed in autumn, glowing golden and swaying in the cool breeze. This is all thanks to Miscanthus sinensis (also known as Eulalia grass, Chinese silver grass or zebra grass, among many other names), and it is just as important to a Jeju fall as the trees. It is found throughout East Asia and is an herbaceous perennial grass, growing as high as 4 meters. Outside of autumn Eulalia is out of sight, forming dense underground clumps or rhizome. They then flower in autumn, shooting up like ears of golden wheat for a few short weeks, before the stems wilt and turn beige in anticipation of the next growing season. Free and unrestricted entry to all sites. Most renowned for the Jeju Fire Festival marking the birth of spring, this beautiful landscape, adjacent to the main Jungmun-Jeju City traffic artery that is the Pyeonghwa-ro, also becomes a sea of Eulalia in autumn. From the base to the crest of the oreum, grass flourishes and the summit affords stunning views across the “jungsangan” — Jeju’s mid-mountain zone — up to Mt. Hallasan and down to the seas. The trail, which continues from Saebyeol Oreum to Idalbong, is a favorite spot for photographers looking to get that perfect autumnal shot. This out-of-the-way oreum provides a more colorful show than Saebyeol, boasting silvers, greens, yellows, and browns due to its more diverse vegetation. Jeongmul is next to the Green Pastures Youth Center, near Isidore Farm, with the surrounding lands predictably populated by horses and cattle. The oreum has two wells, one at its base and another at the peak, where a path allows walkers to skirt the oblique crater. Climbers are rewarded with magnificent views to the ocean and Mt. Hallasan, with the Eulalia often towering above walkers on the trip down. Turn west at the Gwangpyeong intersection on the Pyeonghwa-ro (33 k.m. from Jeju City / 28 k.m. from Seogwipo City). Drive 3 k.m. west to the path entrance. The upland plains of Gasi-ri are famed as horse pastures and this walking trail includes lands that have been grazed at least since the Joseon era (1492-1910), known as “Noksanjang.” Other areas which were reserved for superior horses are known as “gapmajang” (literally, the fields of the “gapma,” as the best horses were known). This is a landscape of many oreum such as Ddarabi, Beonneol, and Keunsaseumi and in autumn they are home to broad sweeps of Eulalia.